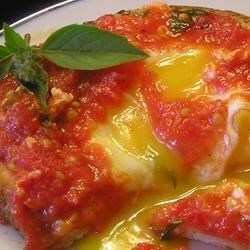 "This is a very loved recipe from my Italian heritage and childhood. Have a nice Italian loaf or French baguette on hand to soak up the delicious sauce." In skillet or frying pan, warm oil over medium heat. Add tomatoes to skillet and cook until juices begin to evaporate, about 3 to 5 minutes. Break eggs into skillet and cook to desired firmness without breaking yolks. Season to taste with salt and pepper. Wake up to easy eggs for a group! This is comfort food at its best. It reminds me of my Nonna's cooking...simple and delicious! I loved this growing up. Having grown up in a Italian household this was my choice of food when I wanted a fast breakfast, lunch or dinner. Still love eating it. This is the best!!!! This dish is delicious and very easy to make. Great for breakfast. I'm glad to have found it. I have no suggestions, it's wonderful the way it is. Easy to make and very tasty! I like that the egg white don't get dry like sunny-side-up.